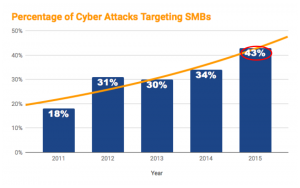 43% of all cyber attacks target small and medium businesses, and that number is only growing. As technology becomes more essential to businesses everyday, cyber security breaches should be a primary concern for everyone. The threats are real, but so are the solutions. You may believe cyber security threats and breaches will never happen to you, but cyber crime doesn’t discriminate. Cyber threats affect everyone, from individuals, organizations, small businesses, large companies, and everyone in between. Government agencies spend as much as $10 billion a year on information security (CNN). The FBI Internet Crime Complaint Center (IC3) reported 288,012 complaints logged in 2015, 127,145 of which reported a loss, with the total losses for that year totaling more than $1 billion—$2 million of that total was stolen from just three individuals under the age of 20 (IC3). In December 2016, Yahoo admitted to a breach that affected more than 1 billion users, the world’s largest data breach to date. It’s evidence that none of us are immune to cyber attacks (Yahoo). If you’re not protected from cyber security threats and breaches, now is the time to contact Fibernet to learn more about our security software and cyber solutions. Using industry expertise and a team of trained professionals, we protect your business from threats like password cracking/theft, phishing/malware, ransomware, SQL attacks, denial of service, and more. Why Invest In Cyber Security Services? When it comes to security breaches and cyber crimes, every business, big or small, is at risk and because of that, it is critical they take the necessary precautions to protect themselves. Even if you haven’t been affected by a cyber security attack, is it still worth the risk not to protect not only your data but your customers? If the unthinkable happens, you want to know you’re in safe hands. Fibernet makes mitigation, remediation, and future prevention easy. We help you detect intrusions quickly, identify what was accessed, and seal the vulnerability against future intrusion. While there’s no easy answer for unwary users, but we can help you minimize the damage and get things running again. It frees your IT and Security teams up to keep the rest of your system running. We are experts trained specifically to deal with security threats and breaches. We handle the overhead and help you build robust cyber security for your system from the ground up. We can also help you with your IT management and cloud hosting needs. Cyber Security is a full-time job that deserves a dedicated effort. If you’re ready to start taking control of cyber threats and want to protect yourself from hackers and criminals, Get a free Nessus Vulnerability scan, or get a free quote and consultation today.